The Jewish Community of Naples is centrally located in Via Cappella Vecchia, in the San Ferdinando district of Naples, near Piazza dei Martiri. It is the southernmost Jewish community in Italy – the only one south of Rome – with jurisdiction over the regions of Campania, Molise, Apulia, Basilicata, Calabria and Sicily. 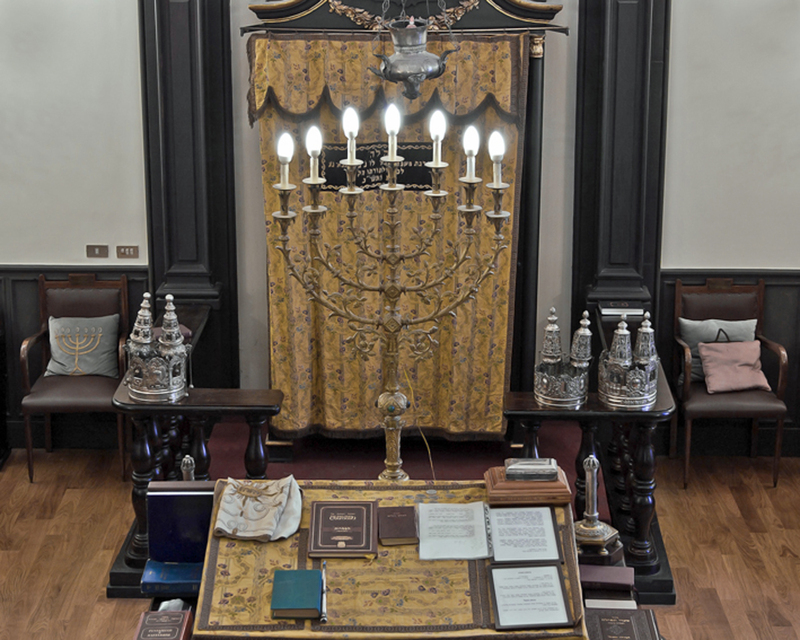 While the synagogue is a testament to the 19th century renaissance of Jewish life in Naples, Jewish presence actually dates back to the 1st Century BCE. Historically, life for Jews in Naples has fluctuated between times of repression, as during the Angevin rule, and periods of peaceful cohabitation, as during the subsequent Aragon reign. In 1541, an expulsion order was passed and all Jews left Naples. From 1740 to 1747, the Jewish community enjoyed a brief renaissance when it was re-invited to the city by the Bourbons, but it was not until 1831 that it was permanently re-established. The present day Jewish Community of Naples owes its existence in large part to the Rothschilds, the prominent family of German bankers. Carl von Rothschild was sent to Naples in 1831, where he established C M de Rothschild & Figli. The operation became the dominant banking house in Naples. The family lived in Villa Pignatelli near the current synagogue and for several years religious functions were held there. Following Italian unification in 1861, with many Jewish families living in Naples, the Jewish community was formally established. The current premises in Palazzo Sessa were rented for religious functions. Adolf Carl Rothschild financed much of the restoration and the Rothschild family were active members in the community right up until the death of Adolf Carl in 1900. In 1910, industrialist Dario Ascarelli, then president of the Jewish Community, donated a substantial sum of money to buy the rented premises. Those funds, along with a generous inheritance from Baron Rothschild and contributions from other community members led to the purchase of the current synagogue in 1927. During the 1920s, there were close to 1,000 Jews living in Naples, but the number has decreased over the years. During the Second World War, the city lost 14 members, who had left after the passing of the 1938 Racial Laws, and were eventually deported. By the end of the war, 534 members remained. Today there are approximately 200 individuals, including new members in Trani, a recently revived Jewish community in Apulia which officially became part of Naples in 2006. The synagogue has been restored to its former splendour thanks to contributions from the Cultural Heritage Ministry. It is an active place of worship and the hub of religious and social activity.